With the judge requiring current athletes get involved now in order to consider them as a party should the player likeness lawsuit be certified as class action attorneys today revealed the names of those that will now be added to the case bringing the total number of plaintiffs to 22 – 16 former athletes and 6 current ones. Robinson, Garnham, and Fischer are all fairly significant contributors to their teams. Alipate hasn’t played a down in four years of eligibility, Keise had one reception in 2010, and another is a kicker. As far as NCAA Football 14’s rosters go it appears Alipate and Keise were not represented at all by a character with their number. Their experience and level of play however is really inconsequential to whether their likenesses were or were not improperly used. The decision on whether the case will be certified as class action could come within the next few weeks. 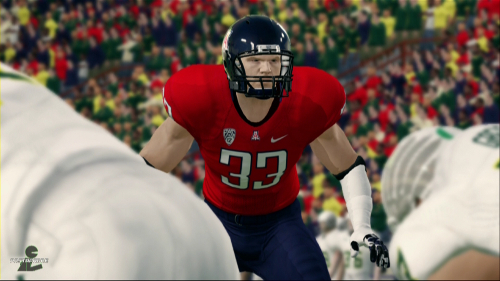 The discovery of Tim Tebow’s name being in NCAA Football 10 could throw another wrench into EA’s series of arguments. Depositions from former Alabama wide receiver Tyrone Prothro and UConn basketball guard Tate George support the defendant’s reasoning for denying class action certification. The class action hearing resulted in the judge heavily questioning the legitimacy of a potential class and insisting a current athlete be involved. The judge required current athletes be added as plaintiffs for that party to have representation if the case is certified as class action.